When I was 15 years old I was fortunate enough to have a teacher that would change my life, even if he didn’t know it. The teacher was Coach Manning, he was a first year teacher, a coach, a coach teaching history at that. I was the furthest thing from someone that would be working with a coach, sports weren’t an activity I was excelling at. I lived in fear of the unholy day in P.E. class that was "Battle Ball", spending my class time under the bleachers drawing. Now, being his first year, he had a fresh excitement that got me enlivened about the subject. Slowly history became my favorite subject, and I was constantly reading, trying to learn so many varying perspectives from different books documenting historical events. I was hungry and I was searching, trying to find some sense of myself in this world, something to live for. In history, I wanted to learn about what others went through, and maybe some sense of truth that could be found in that experience. Finding truth seemed to escape me though. No matter how I searched, how much I read, I couldn't find that thing that lit the fire in my heart. Little did I know that it was there all the time, which is usually how it works. After a class discussion about the Jewish Holocaust of World War 2, Coach Manning called me over to stay after class. He handed me a tattered, small, paper back book. The pages were yellowed, aged, heavily read. 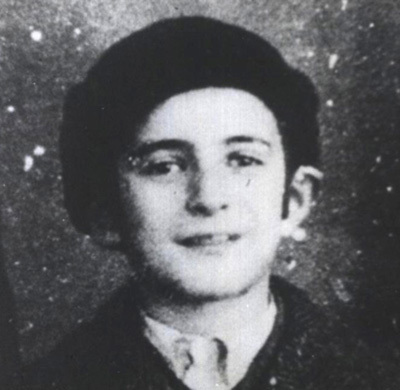 The book was his personal copy of Elie Wiesel’s “Night”. Coach Manning knew I was searching. As we spoke about human rights, religion, and capitalism, he referenced different aspects of “Night” and told me to give it a read. I did read it, cover to cover that evening. From there I had to re-read it, again and again. Each tattered, yellowed page held a world I had never seen, a world that wasn't the facade of happiness, instead, showing the pain and suffering of life. Once seen, it can never be forgotten, and those affected work to live with the reality of anguish and adversity in this world, standing up to fight against those unjustly causing it. For the first time in my life I felt connected, I felt purpose, I felt that there was something to fight for, the human right to live. “Night” chronicles young Wiesel’s years in the concentration camp Buchenwald. Buchenwald was liberated when Wiesel was 16. Though free, he was forever scarred, creating a reminder that this world has the capacity to create Hell, especially when good people stay silent. Without suffering, we can never truly understand the need for change and to help our community with love and respect. “Night” introduced me to a world that didn’t have answers but instead had the need and urgency for taking action. Instead of working towards heaven, I now wanted to work to help my community around me, and to change the world we live in, so this hell could never happen again. Elie ignited a passion in me that grew into an inferno. The feelings I had inside directed me to a life of questioning everything, accepting nothing blindly, and working towards the change needed to help make a difference in the lives suffering around us. Reading and re-reading “Night” throughout high school, I began questioning everything I thought I knew. If the God I had been taught about allowed this atrocity, how can he be good? Where was he in the times of torture and loss for these people? What was this idea I had created of "God" and what did it even matter in a world that can have this atrocity happen? What is it all worth? One story from “Night” stopped me, and causing me to sit in silence, processing what I had just read, a vision of the world in a way that was real, frightening, and identifiable. His words describe a scene that should never been seen, the death of a innocent child. And we were forced to look at him at close range. He was still alive when I passed him. His tongue was still red, his eyes not yet extinguished. That line, "Where He is? This is where--hanging here from this gallows..." kept running through my mind, over and over. 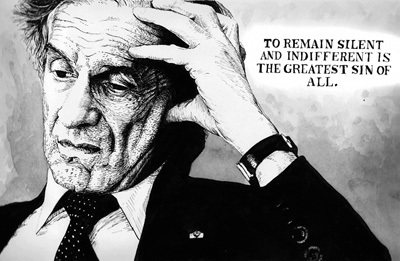 There was no looking back, blissful ignorance could no longer blind me, Elie Wiesel had changed my life, something I am forever grateful for. After finishing that course, I lost contact with Coach Manning, but I held onto the copy of that book that he gave me, bringing it with me to college and my adventures after. Like all good books, I gave it away to a friend whose life was also changed, and hopefully he gave it away too. My passion and direction was found, one now shared through ink on skin and ink on paper. I dream that in the future, that passion will be written in a tattered book, pages yellowed with aged, creased from being well read. Hopefully those pages will being given to a young, wide eyed student, one searching for reason and cause. One that will create a better tomorrow. Technology gives us the opportunity to find knowledge at our fingertips, so here’s a link to the book that changed the lives of so many. Read Elie Wiesel’s “Night” here. Then, read it again, and again. Let it sink in, and then read it again. Thank you Elie, and may you finally find your peace, may you finally rest, though continuing to challenge the rest of us to work tirelessly until everyone is free.